Can't Wait Willow, written by Christy Ziglar and beautifully illustrated by Luanne Marten, is the story of a young girl who learns an important life lesson through the gift of a second chance. Willow has a hard time saying 'no' to various distractions on her way to the Over-the-Top Circus. When she arrives late and has no money left, Willow realizes that she can't enjoy the Circus or the cotton candy she was so looking forward to. A neat feature of the book is the little star on each page that helps parent and child to discuss the choices Willow makes along her journey. Talking about consequences and how one decision impacts another can help children make more thoughtful choices in their own lives. 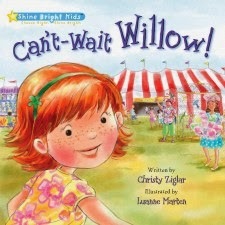 Can't Wait Willow is the first book from Shine Bright Kids -- a book series that provides children and their families the opportunity to discuss key life skills through the sweet stories of Willow and her friends. Check Out: Shine Bright Kids for games and resources and to sign up for the newsletter. Buy It: You can buy Can't Wait Willow via Barnes and Noble. Win It: One Sowing Dandelion Seeds reader will win a copy of the hardcover book Can't Wait Willow. I find it hard to say no to chocolate. So funny! Or should I say "Sew -- a needle pulling thread!" Those carnival games with cheesy prizes that we end up donating anyway. We can't say no to singing. One of those simple pleasures would be candy. I have such a sweet tooth! backing is a simple pleasure that I can't say no to. Ice cream sandwiches! lol my son always reaches for it and cries when I do not give it to him. Reese's peanut butter cups or Butterfingers! We love playing in the rain. A perfect way to relieve stress and be carefree. I find it very hard to say no to playing dolls with my daughter! i'm on a gluten free diet but well on pizza nite whos heard of gluten....lol I just can't go with out real pizza! We can't say no to chocolate! My daughters and I cannot say no to candy, jigsaw puzzles, and the tv series 'Once Upon a time'. I have a hard time telling her she can't play with a friend for whatever reason. I like for her to play with her friends, so I want to say yes - but sometimes, other things are more important! We have a hard time saying no to chocolate. I love naps. I know they can and do interfere with my regular sleep at night, but it just feels so good to crawl into bed in the middle of the day. I love snuggling in and dozing off. Stacking blocks and knocking them down. We both think it is fun.